Summertime and the livin’ is easy . . . isn’t that what they say? The Professor and I have certainly enjoyed this gardening season – digging, yanking, pulling, mulching and planting these past several weeks. And we have bats!!! (Save the commentary; I’m aware I left myself wide open . . .) We hung a bat house two years ago and we finally have bats who think the new digs are pretty great – and we are beyond thrilled they are eating all those pesky mosquitos who seem to love me in particular – so welcome to the homestead, little guys. We’ve been back in the kitchen a little more these past few weeks too; our friends at Jovial sent us some of their new gluten-free flours to play with and we’ve been having fun baking sandwich bread, pizza dough and a few summer cakes. 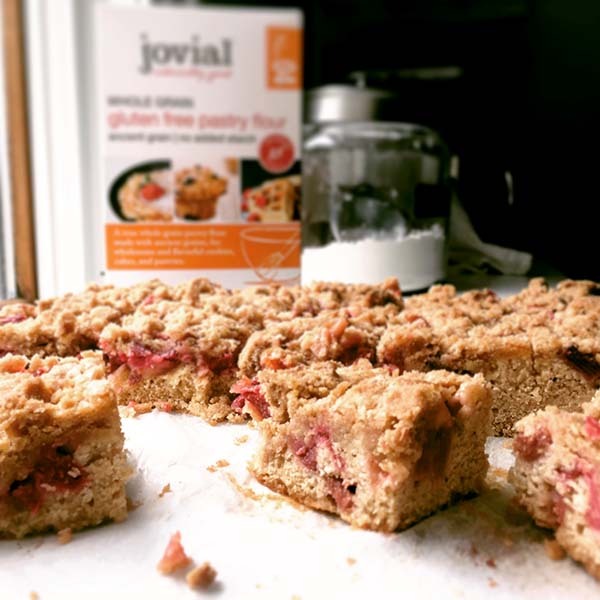 What sets Jovial flours apart from others on the market, is that these are blended using ancient grains and no added starch – a first in gluten-free baking. All flours are milled in Italy in an allergen-free facility which means whatever you’re baking is safe – a big deal when it comes to food allergies. There are also four flour blends – two for baking pastry and two for baking breads; all have added gums so no need for any additional binders. Our boxes arrived about the time our garden rhubarb was ready and luck, kismet good fortune – whatever you’d like to call it – the stars aligned and I caught this recipe from Deb of Smitten Kitchen fame; we could not have been happier with the way this cake turned out. In fact, we made two and shared both – everyone said if they didn’t know better, they’d swear it was a cake made with regular flour. Disclaimer: This is not a sponsored post; however, Jovial graciously sent us boxes of their new flours to bake with. As always, all opinions are my own. NOTES: The only change I made to Deb’s original cake is the swap of gluten-free flour and the use of kefir in lieu of sour cream – everything else is the same. You’ll need to head over to Deb’s page for the instructions for putting the cake together.